[Shared, with permission, from Karen Konzuk's blog] Copy & image credit: Karen Konzuk I have recently received compelling stories from customers as to why they have chosen our concrete bands to symbolically represent their marriage. It has me thinking that it might be beneficial if I share some information about concrete. Perhaps the earliest known occurrence of cement was twelve million years ago (according to Wikipedia). It is amazing to think that a material that was discovered millions of years ago is still being used today, and not to mention innovatively! ie. jewelry! Concrete is a sustainable and affordable resource which is made up of an aggregate, cement and water. When you think of the definition of aggregate it is described as, “a whole formed by combining several typically disparate elements.” Sounds a lot like marriage, doesn’t it? Concrete only gets stronger and better over time. It takes many years for concrete to reach its true strength. It also will change over time with daily wear to reflect your tendencies. Concrete is strong enough to survive many disasters, such as fires, earthquakes and storms. Also sounds a little like marriage. We all have our ups and downs and know that we can make it through. 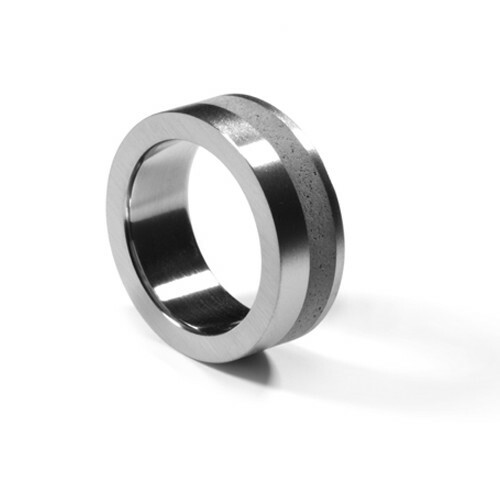 So what have customers said about why they bought concrete rings? 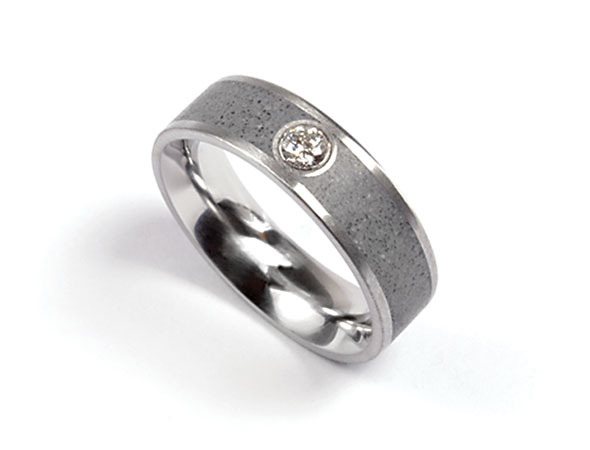 One customer told us, “Our 17th Anniversary wedding bands made of concrete and steel. Strong and unique, like the love we have for each other. 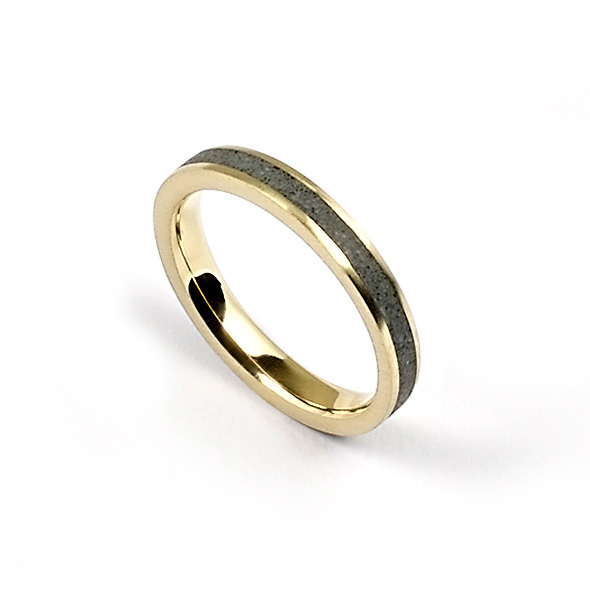 A friend of mine told me the other day that we were the only couple he could ever imagine trading in their gold and diamond wedding bands for concrete and steel.” And another, "It’s just because we thought they looked cool, they were affordable and something more snazzy than a simple gold band. I’ll proudly wear it knowing just how well it represents the fabric of what we have.” There you have it! If you are looking for something to represent the growing strength in your relationship, the combining of many elements to make one, that ever lasting union, and something that will weather the hard times, then concrete is a perfect choice! - Karen Konzuk If you're interested in seeing more of Karen's work, join us at her trunk show Saturday, April 16th, from 10-5p. She will be launching her STELLAR line of concrete & diamond dust jewelry, as well as bringing a full collection of her concrete rings and jewelry.